Holiday season is in full bloom and with my holiday only a week away I though now would be the perfect time to share with you some of my travel and packing tips. I am no expert but I would say I am a well travelled girl with plenty experience of long journeys, restricted weight allowances and packing quickly and efficiently. Tick, Tick, Tick. Check lists are super dooper useful as they keep you organised and I love ticking a box when I put an item into my case or bag. It is also a really good visual way of planning and seeing what you are actually taking with you so you don't end up with loads of impulsive items you have just chucked in that take up loads of roam. Comfort in key. Make sure you are wearing really comfortable clothes when you travel, there is nothing worse than sitting in those jeans that are too tight or walking around the airport in shoes that rub and make your feet hurt. Wear clothes that you know are trusty comfortable pieces. Keep on rolling. Rolling your clothes is a great way to save on space as your rolled clothes will fit together well and you can also squeeze them into the sides of your case and any gaps. Plus when you arrive at your destination you won't have to worry about ironing crinkled clothes as rolling minimises wrinkles - it's a win, win! Double up those products. Especially for beauty items you can use one product for a couple of different things. This way you can still get the same look but with less products. Cream blush can be used as a lip product, your bronzer can work as an eye shadow either for all over the lid or just in the crease and bring a high coverage foundation becuase if you mix in some moisturiser you can create anything from a medium coverage foundation to a sheer tinted moisturiser. Electrical bag. I like to use a little pouch or small makeup bag to put all my wires, chargers, headphones and small gadgets in. It keeps everything together and saves you rummaging through your bag looking for that wire. Also it means I can just grab this bag before I leave the house and I have everything I need. 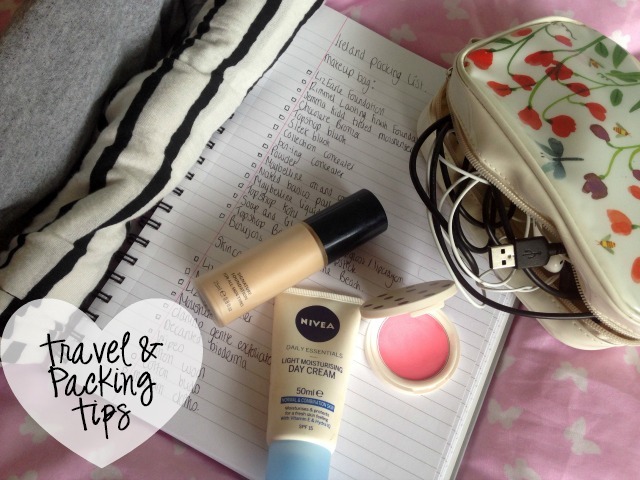 What are you top tips for travelling and packing? Great post! I can't cope without lists on holiday! Me neither, they are a life saver! Love this post :) I see your coming to Ireland! I hope you enjoy although our weather isn't the best at the moment!